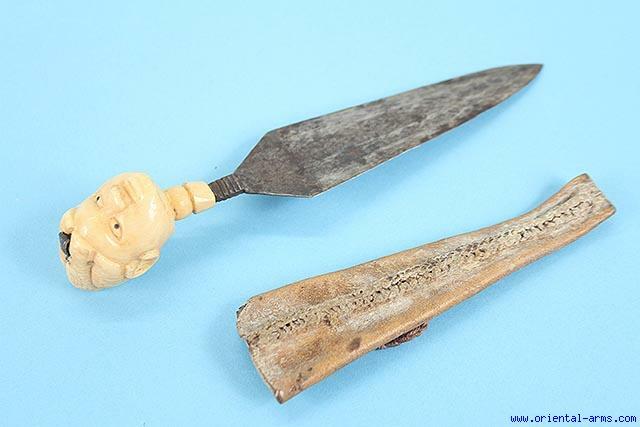 A rare short dagger of the Mangbetu people. The Mangbetu live in north east Congo and were famous for their high quality art and craft especially musical instruments and weapons. This dagger has a very nice double edged hand forged blades 6 inches long. Carved Ivory African head shaped handle . Brown leather scabbard (Lightly shrink). Total length 9 inches long. Very good condition. Late 19th or early 20th.